Weekly Photo Challenge’-One Shot, two ways – Dancing in the rain! One Shot, Two Ways. This week, photographer Jeff talked about his process of finding the best shot. Before taking a picture, he studies his scene — looking at a shot horizontally (as a landscape) and vertically (as a portrait). With this honed, critical eye, he decides what orientation works best for his photograph.For this challenge, capture two images — a horizontal and a vertical version — of the same scene or subject. There are no concrete “rules” here, but a) it should be evident that both shots are of the same place/location or person/thing, and b) your photographs should ideally have been taken during the same shoot — where’s the challenge if you’re just plucking out pictures of a particular location or person from your archives? 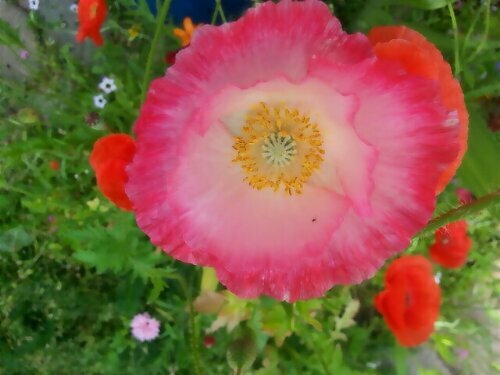 I chose my garden as the subject, in particul a whimsical pink poppy. 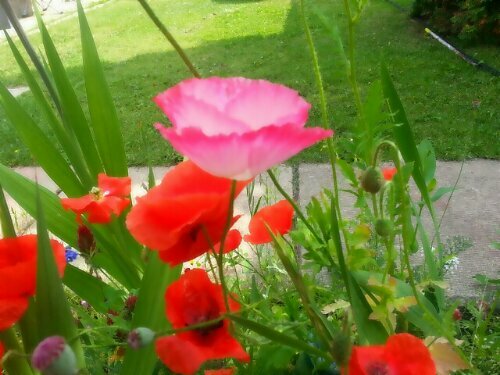 Flowers are so delicate and beautiful and you can capture something totally different when viewing from different angles. I took a portrait shot and a landscape looking from above.